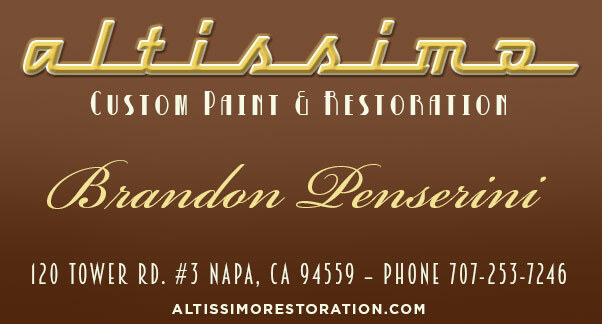 Brandon Penserini from Altissimo Restoration in Napa California set out to create his ultimate Hollywood Style 1936 Ford Roadster. 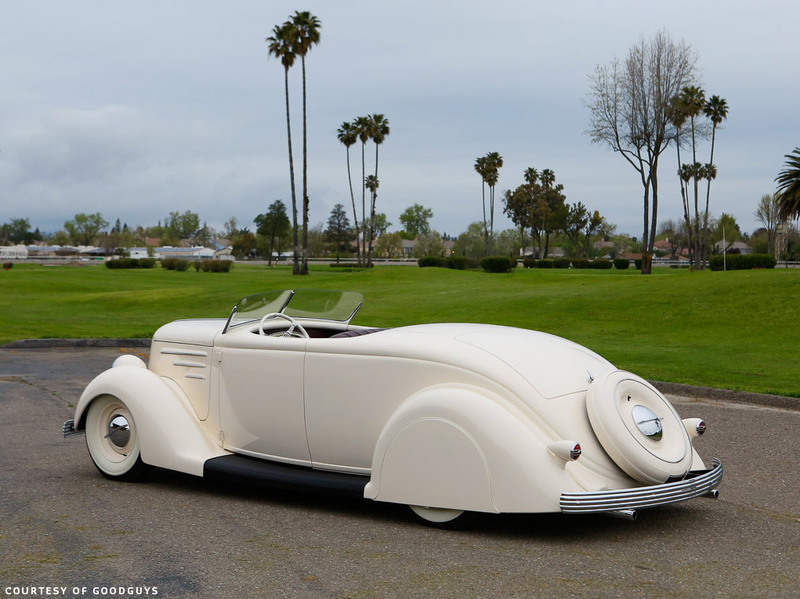 Starting with an 5 Window Coupe he used his excellent skills to create this award winning Venus Roadster. In the summer of 2016 I saw a few photos of Brandon Penserini’s 1936 Ford project for the first time. Brandon owns the Altissimo Restoration Shop in Napa, California and he had recently finished Scott Robert’s beautiful Olive green 1954 Mercury. A Custom I helped pick the color for, which was beautifully matched by Altissimo. So I was really looking forward to see any new projects coming from Brandon’s Shop. The photos of the ’36 Ford Roadster Project really caught my eye because of the combination of Nash grille and DuVall style windshield. An absolutely beautiful combination, which I had never before seen combined on one car. Plus Brandon mentioned several times on his Instagram account that the car would have a lot of Hollywood Style Art-Deco influences…. I could not wait for new updates! Brandon had some beautiful glamor photos taken of his ’36 Ford with some beautiful Napa area backdrops creating a very much Hollywood style setting. This low angle front 3/4 view shows how beautiful all the styling elements used on Brandon’s 36 Ford come together. 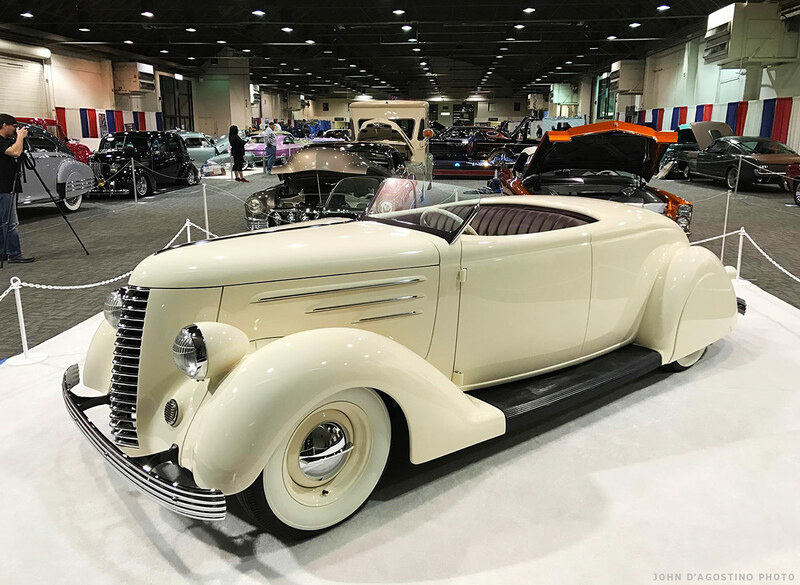 The light cream color was very much inspired by some of the ’30’s Duesenberg’s and Cadillac’s created for the rich and famous. 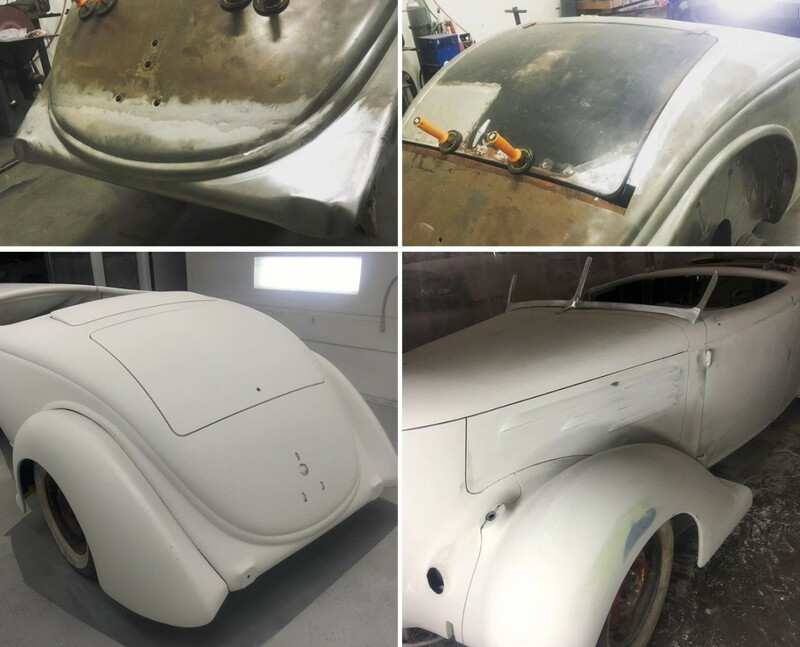 Over the following month I followed the progress of Brandon’s ’36 Ford online, and saw it getting shaped from once a 5 window coupe parts project to a stunning looking ’36 Ford Roadster with many one off Custom Restyled elements. Slowly Brandon shared more and more details of the car he was creating for himself in his spare time at the shop. 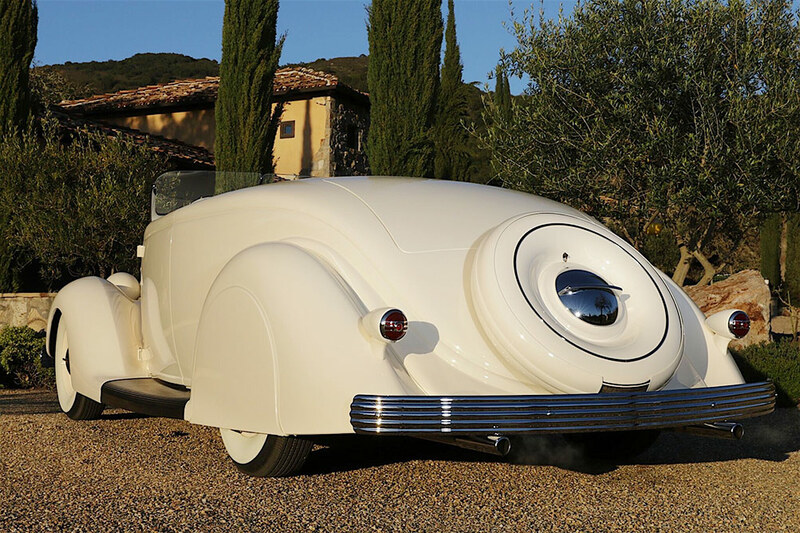 The car was going to be created as if it had been restyled for perhaps an Hollywood movie star back in 1937. As if it had been ordered from one of the Coachbuild companies so Bohman & Schwartz, or Darrin, or perhaps from early Custom Car Icon, George DuVall. Brandon mentioned several times that the goal was to debut the car at the 2017 Grand National Roadster Show in Pomona California. In late 2016, just weeks before the show it was clear that Brandon had to work many late nights to be able to get the car finished in time for the show. But he did make it in time, and the car debuted at the 2017 GNRS and was a HUGE success with the crowd. 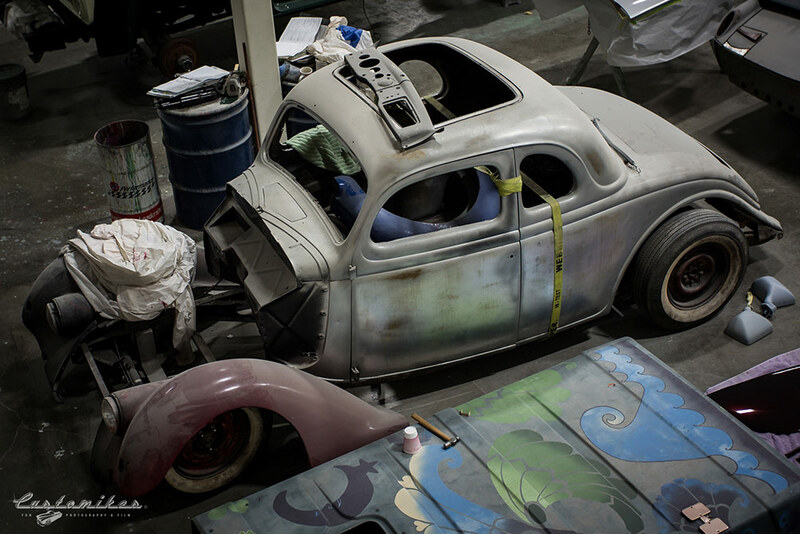 During the creation of “Venus”, which is how Brandon named his project ’36 Ford Roadster, he tried to use as many vintage and period parts as possible. All in an extreme high concourse quality manner. He sourced the perfect color braided wires for all electric wiring, he hand made wire looms, and the all hand made wood dash with hand machined brass dash knob bases is absolutely stunning. Brandon has decided to let go of his dream car 1936 Ford Roadster “Venus“, so that he can concentrate on a next project. 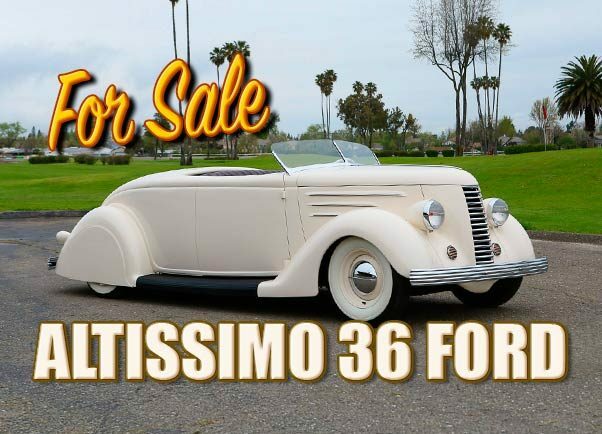 This is your chance to own a totally unique, extremely well crafted Hollywood style Concourse Quality ’36 Ford Roadster Custom. Contact Brandon Penserini for more information and offers. 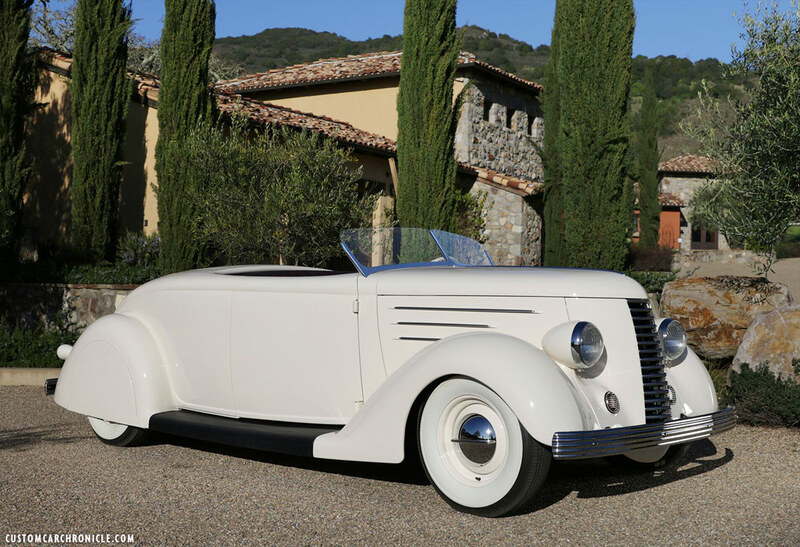 Lets hear from Brandon Penserini in his own words how he created this stunning Hollywood Style Custom ’36 Ford. Venus started her life as a 1936 Ford 5 window. The body was neglected and was partially disassembled, presumably abandoned for a parts car until my friend picked it up for a project. He accumulated many original parts- many original FoMoCo. But plans changed when I convinced him to trade the car to me, as it was destined to become an Early Custom Car, resembling what would have been done during the 1930’s. Rear quarter view by Trent Sherrill shows the extended rear fenders, hand made early style fender skirts, reshaped De Soto bumper, the “gentelman’s trunk above the regular trunk, and the spare tire cover which also houses the gas filler. Beautiful bird’s eye view photo showing the cockpit with the hand made wood dash, the home made V-Windshield and the Plante upholstered interior. PearlCraft in Australia did their magic on the pearl finish on the ’37 Ford Banjo Steering wheel, the gauge cluster and dash knobs. 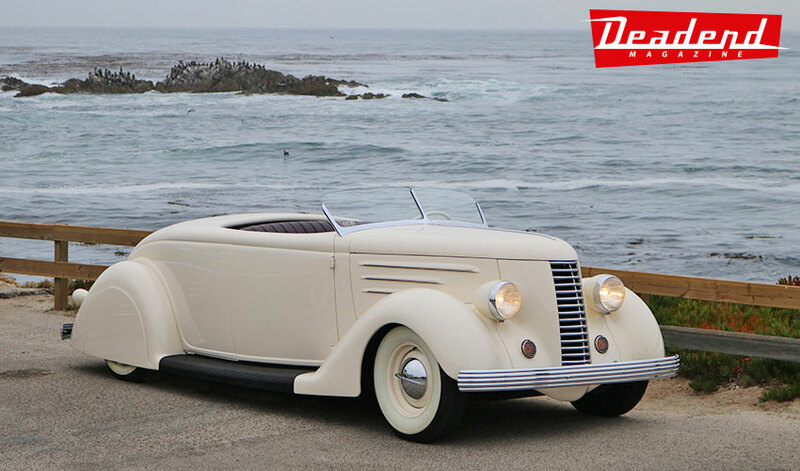 Some of the styling of this ’36 Ford was inspired by its bigger cousins, namely Packard, Duesenburg, and the larger Chryslers and V16 Cadillac Roadsters of the same era. In the 1930’s owning a full time “open car” was a pure luxury. Most Custom Roadsters did not have tops, as they were intended to be a fair weather only car and were likely one of many in the owner’s collection. 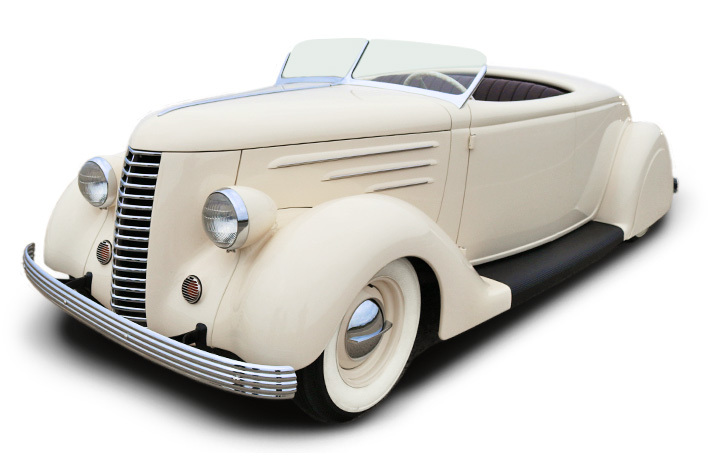 The body of the ’36 Ford was very short in comparison to the Packard or Cadillac roadsters, which would prove to be the biggest challenge of the build. 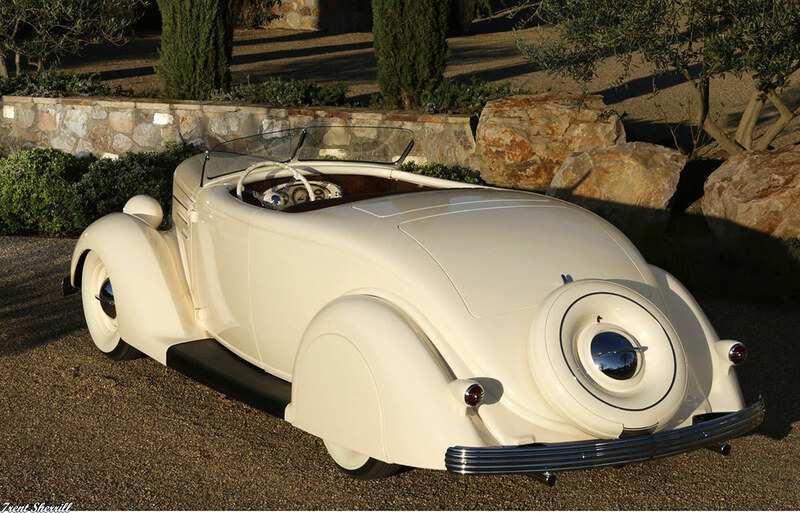 The result of Venus is a stunning, Bohman and Schwartz inspired 30’s styled roadster-a believable example of what would have or should have been done when coachbuilding was at it’s peak. All of the sheet-metal, body and paint was done at Altissimo Restoration– an award winning shop, who does well at both a concourse setting and Custom Car Show scene. They win top honors every year and are especially praised for their paint work. They have won the highest honors, including the Bailon award, Custom of the Year and countless other awards including best of show, best paint and high scores at Pebble Beach. Chris at Plante Interior did the beautiful in style upholstery in mahogany leather. The trunk of the car is done in the same style. 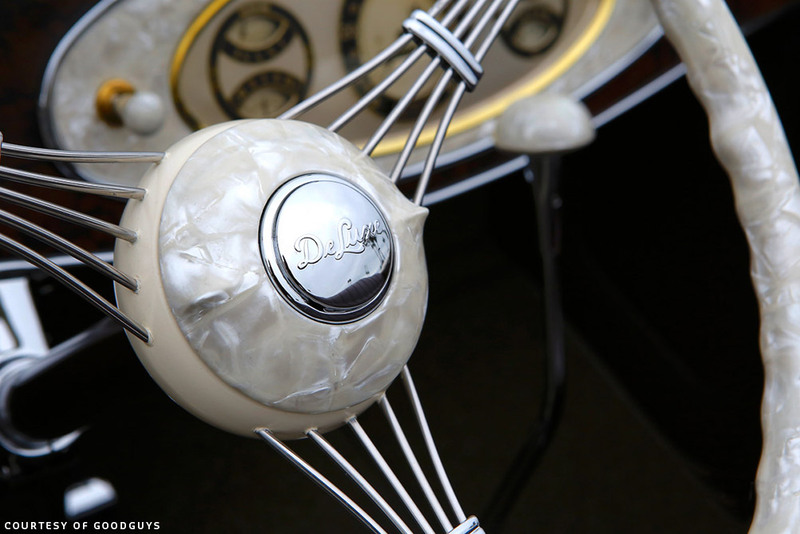 Pearl wrapped 37 Ford Deluxe steering Banjo steering wheel and dash knobs. 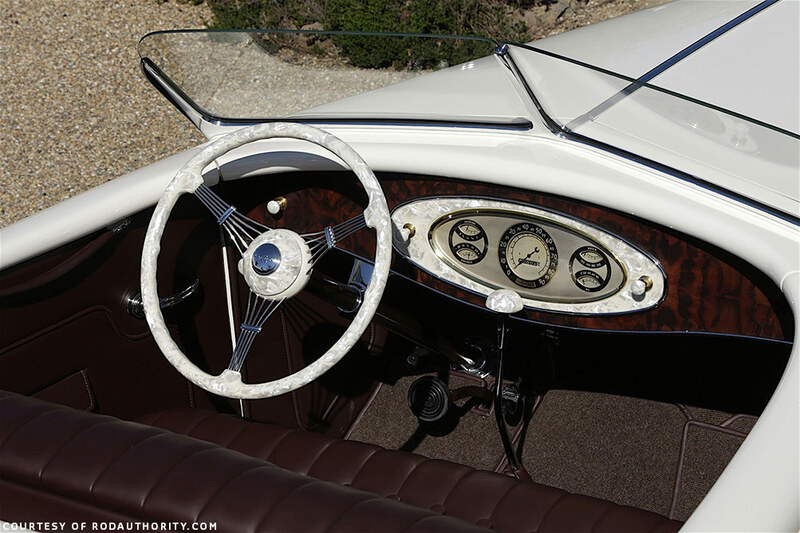 The dash’s instrument cluster was inspired by a ’36 Mercedes and has a pearl insert and utilized a 1934 Plymouth gauge cluster. The dash itself was handmade from Claro black walnut burl by Brandon. All of the bezels were made in house as well out of brass stock and turned and polished to perfect. Altissimo chopped the top off and created a Packard/DuVall style Custom Roadster windshield frame, which was hand made. The cockpit area was created by ending the body at the first style line, which lowered the profile and gave a sleeker silhouette and creating an illusion of a longer body. Essentially, the body line rolls into a bathtub style surround and a beautiful and seamless entry into the interior of the car. There is no channel, seal or glass to disrupt the flow of the body. Also, added was a second truck, which in 35 Cadillac called a “gentleman’s trunk”- a small trunk behind the cockpit, where the gentleman might store his ladies coat and purse. The rear fenders were lengthened and both front and rear fender peaks were accentuated. Custom fender skirts were made, as well as Cadillac inspired louvered hood sides. The grill and surround is a ’40 Nash, the fender halves were molded to create a one piece nose, like the Duesenburg. The taillight are ’37 Chrysler on Plymouth stanchions. The exterior trunk handle was fashioned by hand. 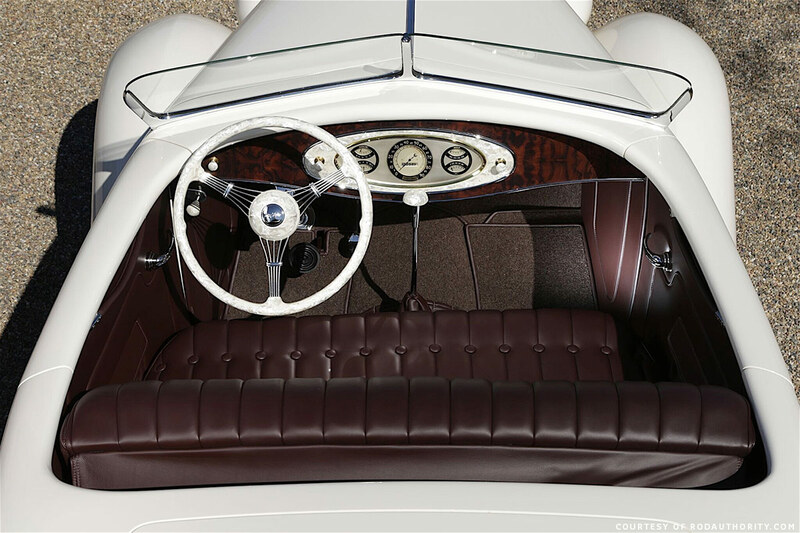 The wheels were finished with custom made baby moon flippers, similar to a 1934 Cadillac V16 roadster. The ribbed bumpers are original DeSoto, re-arched to match the 36’s contours and custom brackets made to sneak them close to body. The spare tire cover has a flipping hubcap that accommodates the fuel filler neck to disrupt any external body lines. Stunning stitch work in beautiful leather by Chris Plante at Plante Interiors. Notice the beautiful finished wrap around section on top of the doors and dash. Brandon wanted to have as much Custom made as possible for the unique Coachbuild feel. He hand made the walnut dash and hand turned brass switch bezels for this unique one of a kind “Venus” dash. 1937 Ford Banjo steering wheel beautiful restored, re-plated chrome and with that sparkling pearl detail finish by PearlCraft. 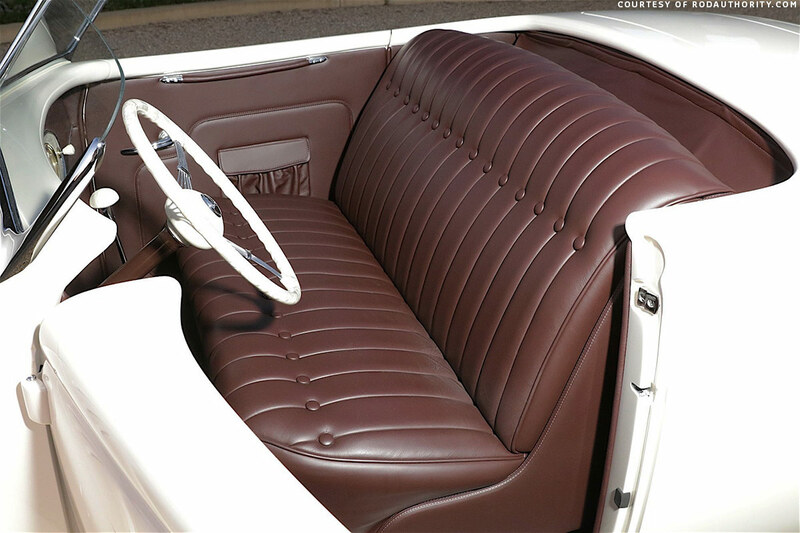 Moving to the interior, one instantly notices the pearl wrapped 37 Ford Deluxe steering wheel and dash knobs. 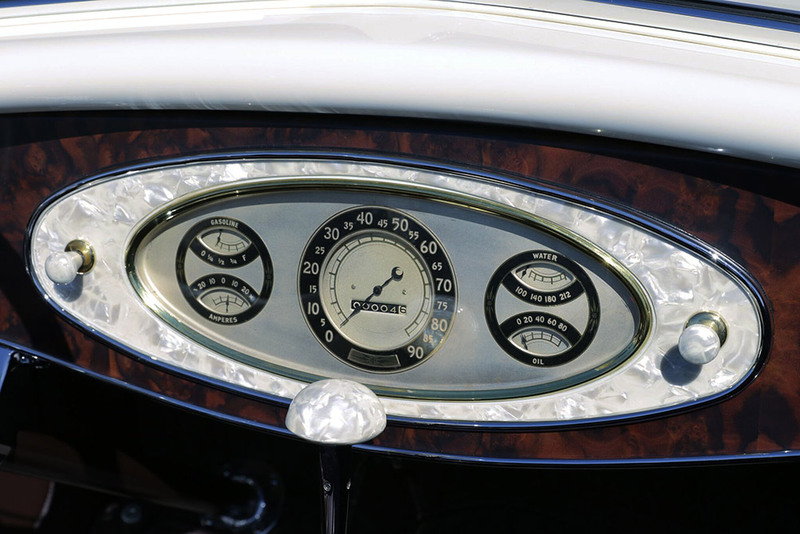 The dash’s instrument cluster was inspired by a 36 Mercedes with a pearl insert and utilized a 1934 Plymouth gauge cluster. The dash itself was handmade from Claro black walnut burl. All of the bezels were made in house as well out of brass stock and turned and polished to perfect. 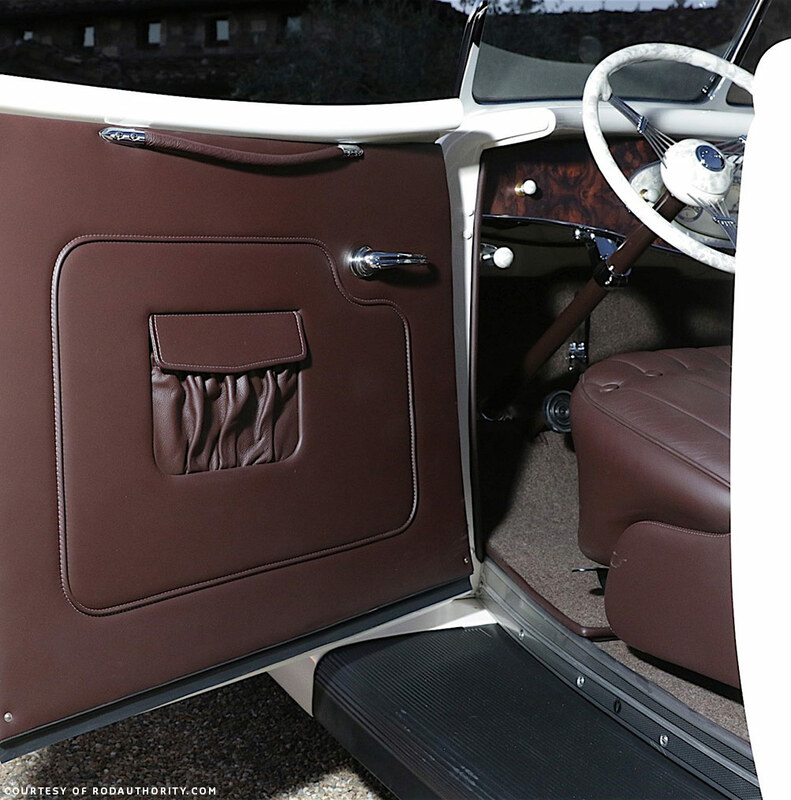 The interior seats panels and all of the trunk areas were custom made and covered in a mahogany colored Italian leather. On the floor, you’ll find Lebaron Bonney’s wool, with edges bound in the same leather and custom floor mats. Both trunks are finished to the same quality as the cockpit. All interior work completed by Chris at Plante Interiors. 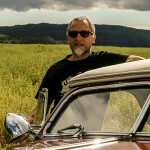 Photographer Trent Sherrill has the perfect feel to capture each car he photographs in its essence. Model Adriana Modabber poses with Brandon’s Hollywood style Custom ’36 Ford to give it the just perfect movie star feel. 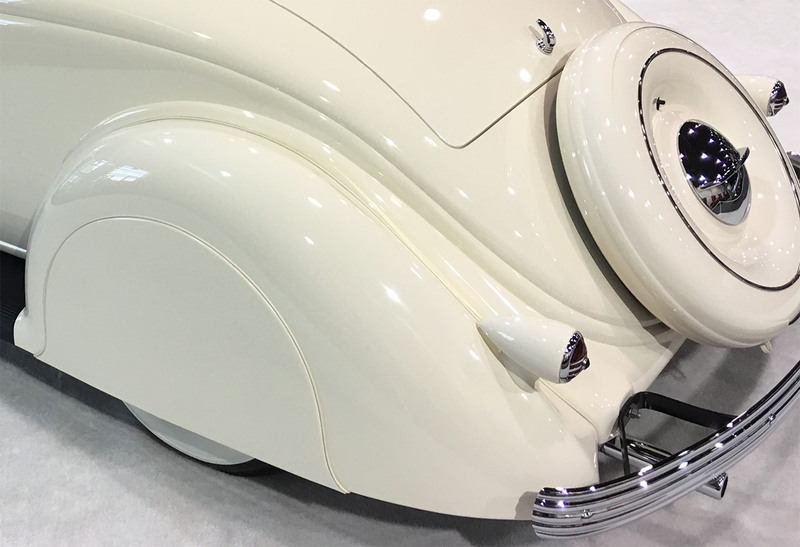 Brandon found a pair of ’37 Chrysler taillights and mounted them on Plymouth stanchions to create the perfect taillights to fit to the extended rear fenders of his ’36 Ford. 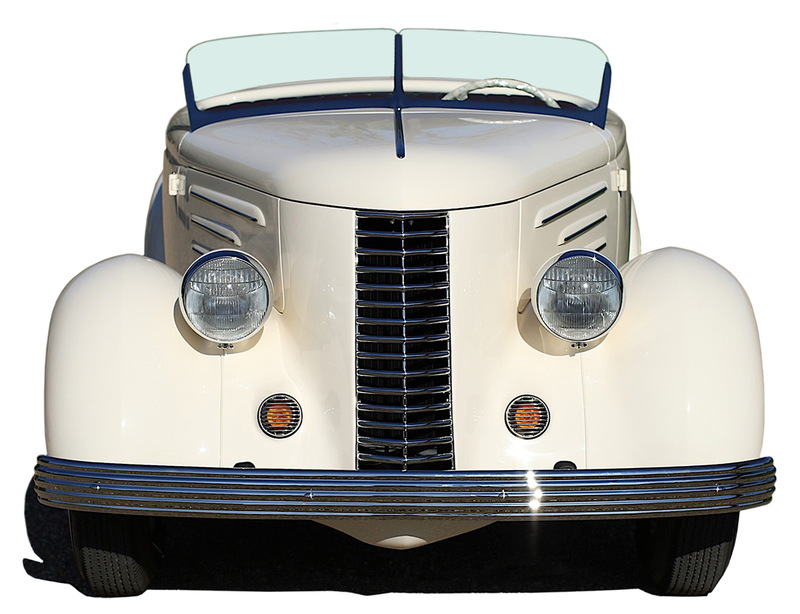 The narrow 1940 Nash grille was flipped upside down to work better with the lines of the ’36 Ford. The grille surround was hand shaped and welded to the fenders for a much smoother look. The enhanced peak on the fenders, the v-shape of the Nash grille and the V-Windshield all work together for the well balanced Custom. The headlights are stock ’36 Ford, but mounted a little lower on the fenders. All of the bright-work and chrome plating was done by Sherm’s Custom Chrome and Plating, in Sacramento. Venus rolls of BF Goodrich Silvertown bias plies and is powered by a beautifully balanced and restored Ford Flathead 8BA in front of a Ford C-4 Automatic Transmission. 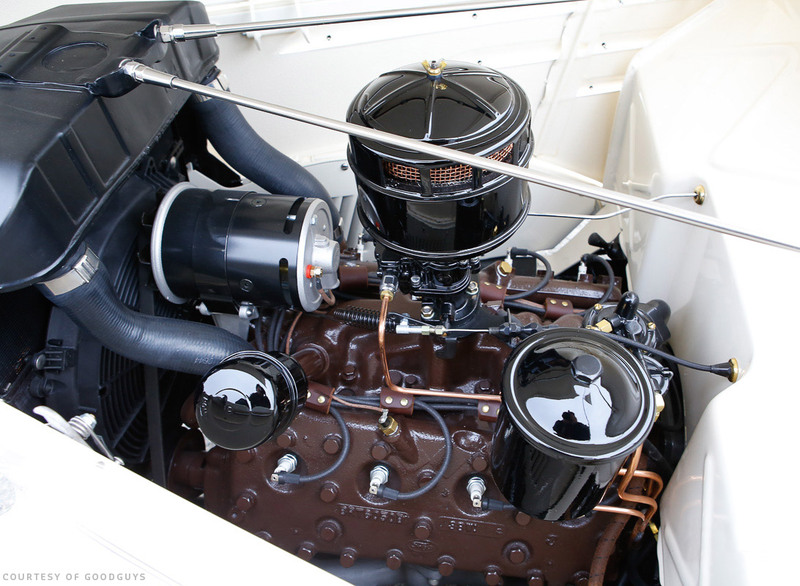 Under the hood, you’ll find a Power-Gen alternator, a single black Stromberg, custom cloth wiring loom and ignition wires- everything is tidy and in show condition. It has a functioning choke, lots of copper and brass accents and a unique ignition wiring loom wrap. Venus is stunning inside and out. She can be driven, shown or displayed in a winery, showroom or collection. While she was intended to be a custom from the 1930’s, using all period parts where applicable, she was built at a concourse level. Venus has been featured in Kustoms Illustrated, Traditional Rod and Culture, on the cover of Gasoline Magazine and shot for two others. In addition, she has won Best Paint, Custom D’elegance, and finalist for Custom of the Year. Extended rear fenders, custom early styled fender skirts, Chrysler taillights, re-arched De Soto bumper and home made brackets for the just perfect bumper to body gap. Beautifully balanced and restored Ford Flathead 8BA. Power-Gen alternator, a single black Stromberg, custom cloth wiring loom and ignition wires- everything is tidy and in show condition. Not shown in the photo is the Ford C-4 Automatic Transmission. The Venus in its natural habitat. (Deadend magazine photo). This photo shows how the rear De Soto bumper was reshaped a little to work better with the spare tire cover and extended rear fenders. The new Roadster like body line created by Brandon flows perfectly around the cockpit. Any angle on “Venus” is breathtaking, but the front 3/4 view like this is my personal favorite view of Brandon’s ’36 Ford. Everything just works so wonderful from this angle. This dead-on front view shows how elements work together, from the v-shaped flipped upside down ’40 Nash grille, the ribbed De Soto bumpers, the Custom hood sides and the V-Windshield with the custom hood trim. Notice the turn signals sitting behind the horn grilles. Venus at its 2017 Gran National Roadster Show debut. Eric Reyes Lettering, Striping and Custom Painting created the stylish Show Sign for Venus. 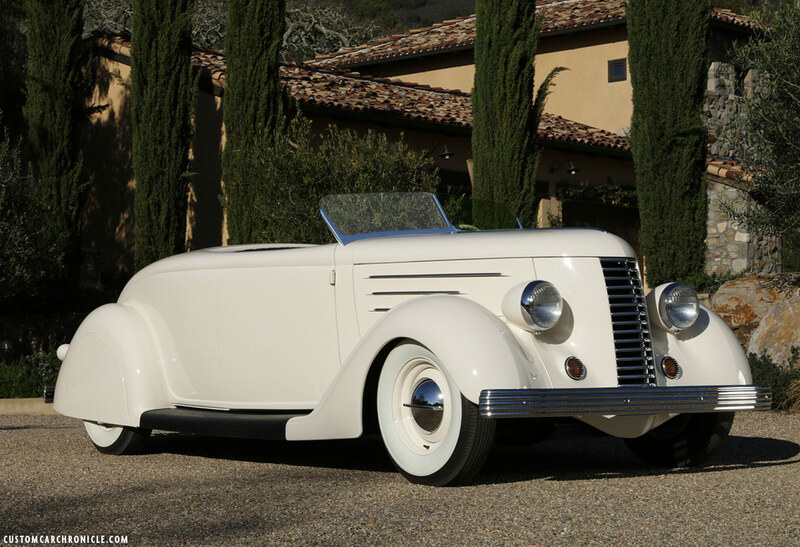 The Brandon Penserini Altissimo ’36 Ford Roadster was created from an ’36 Ford 5-window Coupe. Designed and build by Brandon as if it could have been restyled at one of the famous Coachbuilders in the later part of the 1930’s. Possibly for an Hollywood celebrity who wanted something ultra classic and stylish to cruise the beautiful sunny California roads back in the day. 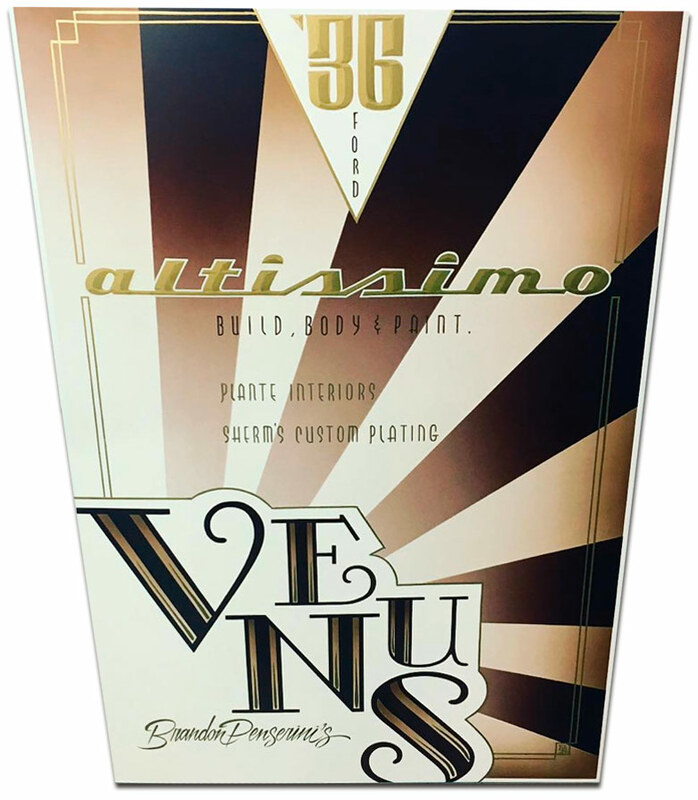 Brandon’s 1936 Ford Roadster named Venus was created at Brandon’s Altissimo Shop. It was Brandon’s personal project worked on mostly by himself in his spare time at the shop. But Brandon likes to thank several people for their support and help during the project. Special thanks go out to; Scott and Holly Roberts, John Aiello, Chris Plante, Rich Olivier, and the rest of the Penserini family. This is how the project started, a ’36 Ford 5-window parts car project. Nice, but not really what Brandon had in mind. The project started with some frame work, and then it was time to remove the 5-window coupe top from the belt-line up. Brandon hand shaped a new roadster style cockpit surround. 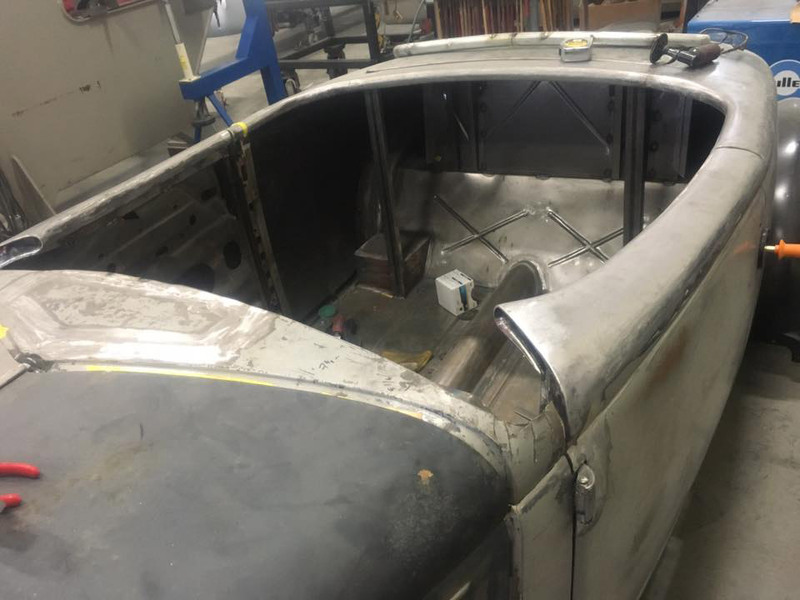 The cockpit surround was hand made from sheet metal styled after the ’36 Ford Roadster, but also at more high end roadsters which had a more wrap around surround. Notice the nicely finished door ends. In this photo the cowl section still had to be shaped. The flipped upside down ’40 Nash grille, new surround, Chevy hood sides and home made v-windshield mocked up. The hand made v-windshield with matching hood trim, and lots of vintage details thru-out the creating of Venus. 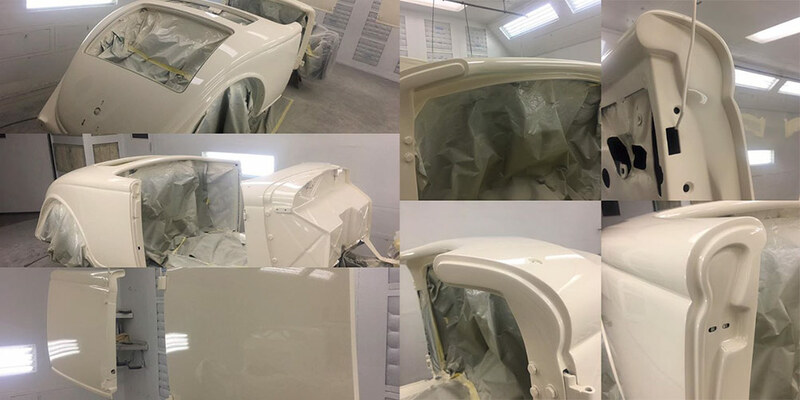 All body work on Brandon’s ’36 Ford was metal finished till perfection before the primer was added. During the light cream paint process. The baby moon flippers, inspired by the early v16 Cadillac roadster are all made in house and beautiful plated at Sherm’s Custom Chrome. Fresh plating from Sherm’s ready to get installed on the freshly painted Roadster. Each car created by Brandon’s Altissimo’s Shop gets an unique plaque installed on the firewall. Brandon completely hand made the ’36 roadster dash. Custom walnut burl, chrome and brass bezels and a 1933 Plymouth cluster. 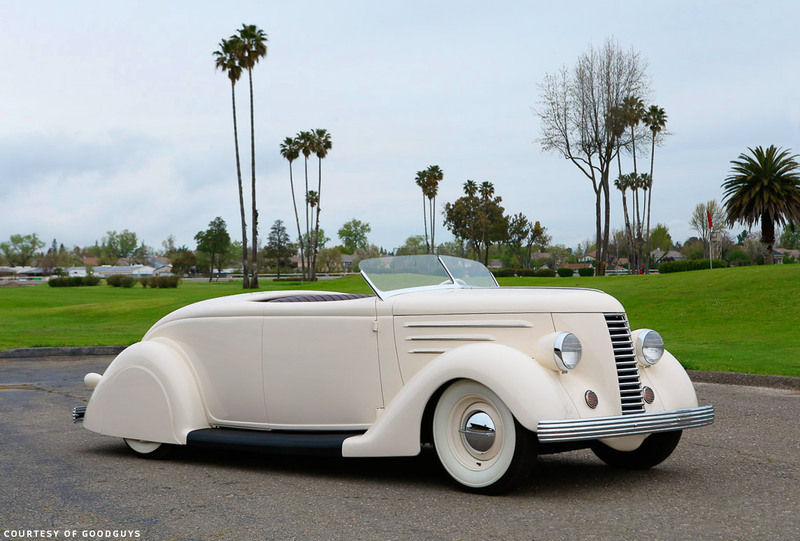 Perfectly styled and balanced ’36 Ford Roadster… VENUS. Beautiful kustom…could not be built (especially that well) for the asking price.